If you've been following my blog, you'll know that the server I've chosen to host my Windows domain is a WD Sentinel DS6100. 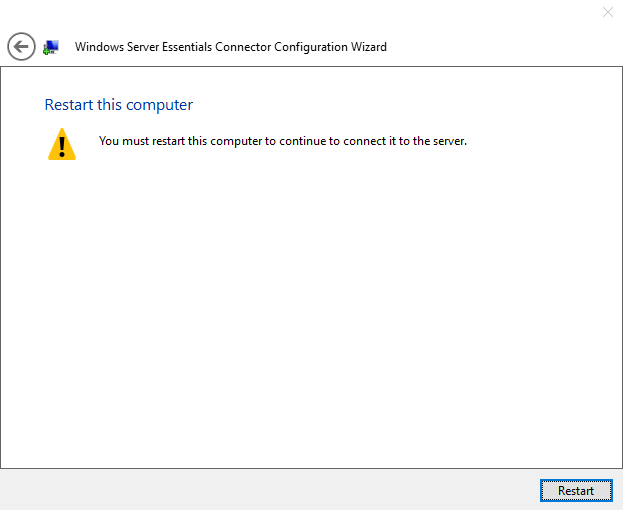 This is a server that originally came with Windows Server 2012 R2 Essentials. 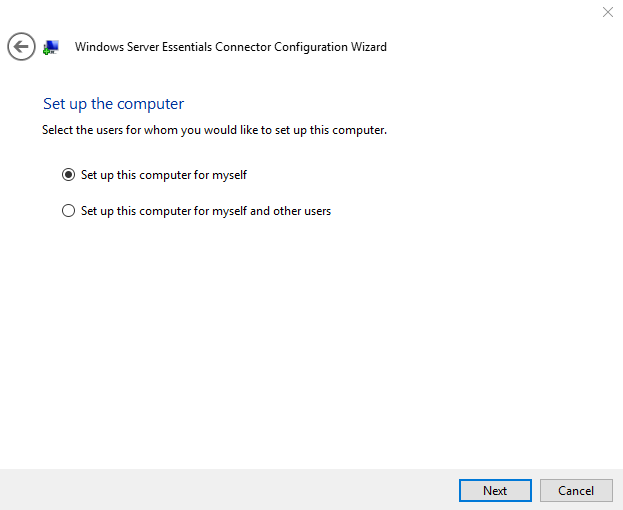 I've since performed a clean install with Windows Server 2012 R2 Datacenter however to keep the LCD and fan working correctly, I've had to install the Windows Server Essentials Experience role, not something you would typically do to a server in a large enterprise environment. Anyway since it's installed, I thought I should have a play with it and note down my experiences. I'm going to start by looking at the client experience. For more information about Windows Server Essentials, have a look at this TechNet article. 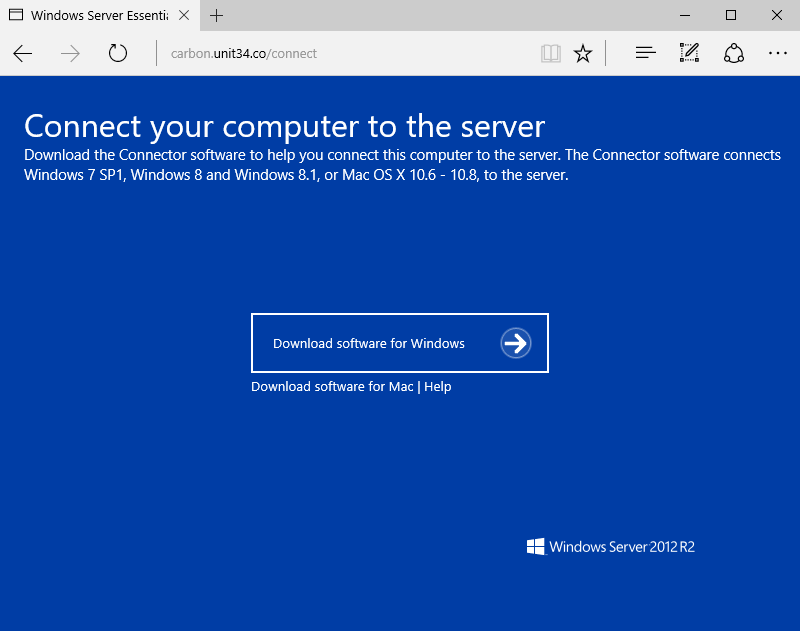 You can connect both Windows and Mac OS X clients to a Windows Server 2012 R2 Essentials server. 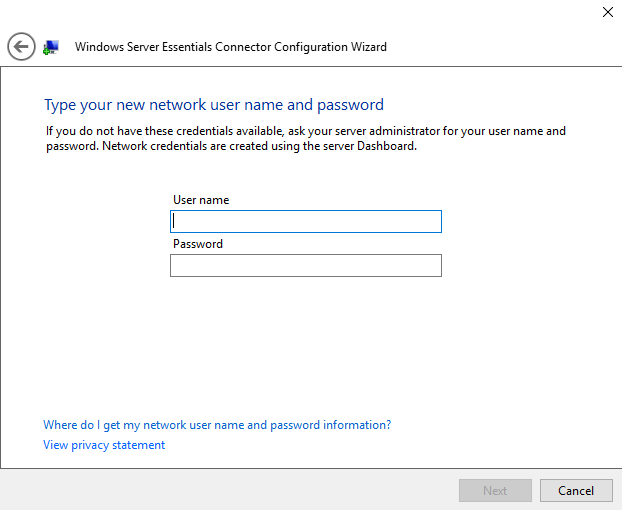 Connecting a Windows client to Windows Server Essentials will domain join the client to the Windows domain however on Mac OS X, it does not. To connect your client to the Windows Server Essentials server, you need to download and install the connector client which can be found on your server. Simply open up a web browser and enter in http://<SERVER>/connect. Replace <SERVER> with the IP address or host name of your server. You must be on the same subnet as your server to connect. 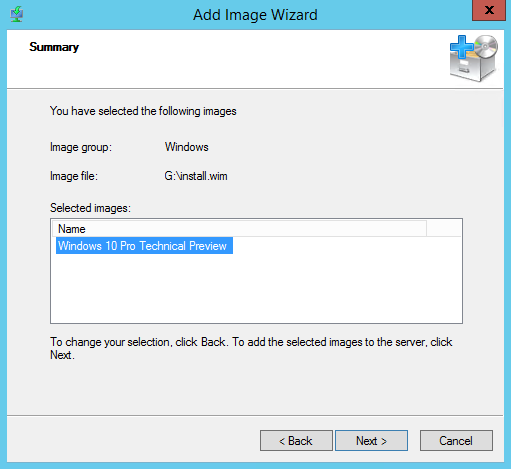 Follow the wizard to connect your client to Windows Server Essentials. You'll need a user account on the server in order to successfully connect. The user account you use will become the local administrator on the client you are connecting. 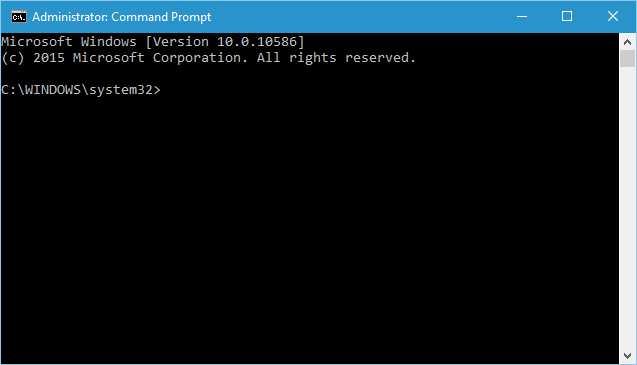 If you are installing the connector software on a Windows client that is not domain joined, there will be one restart to join the client to the domain. It is also possible to install the connector software on clients that are already joined to the domain. 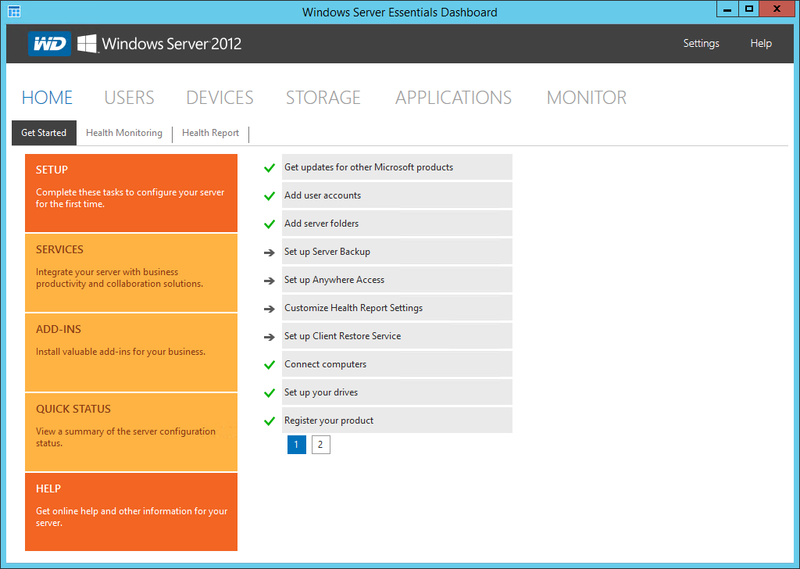 Once the connector software is installed on your client, you'll have access to the Windows Server Essentials Launchpad. 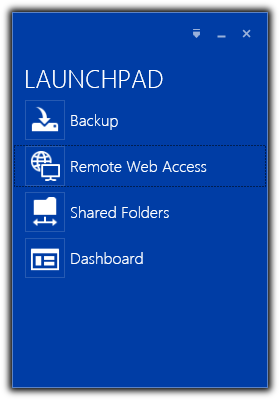 The Launchpad is just a simple app that provides access to all the services provided by Windows Server Essentials. Some of these services such as Remote Web Access will need to be configure correctly before it can be used. 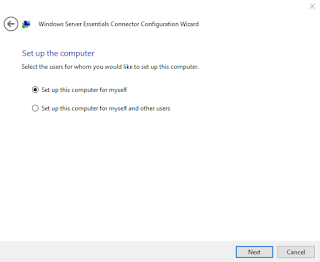 Installing the connector software also gives you access to the Windows Server Essentials Dashboard if you are an administrator on the Windows Server Essentials server. The Dashboard is where you perform all of your Windows Server Essentials administrative tasks such as adding users, removing devices, creating shared folders and managing backups. This is not accessible on the Mac OS X Launchpad though. You'll need to log on locally to the server for these situations. 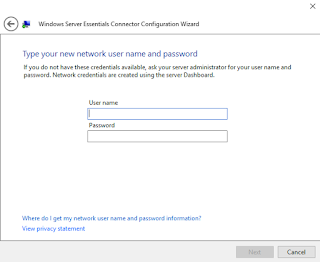 Now you wouldn't do this in a corporate environment but in your Windows domain at home, you may have a parent or partner that doesn't like entering their username and password on their Windows computer that you've domain joined to your network. For situations like these you may want to configure auto-logon. To configure auto-logon for a computer on your domain, you'll need to modify the registry on that computer. Important Note: Be careful when editing the Windows registry. Some serious damage can be done to your operating system if you modify something important. Also for this to work, you'll need to store the password of the user account you are going to use for the auto-logon in the registry. This isn't secure. Start regedit.exe on the computer you are configuring auto-logon and navigate to the following location. In the above location, modify or create the following registry keys. Once done auto-logon is configured. Restart your computer to test. This works for Windows 7, Windows 8, Windows 8.1 and Windows 10. One of the most useful and easiest services you can deploy in your Windows domain is Windows Deployment Services (WDS). 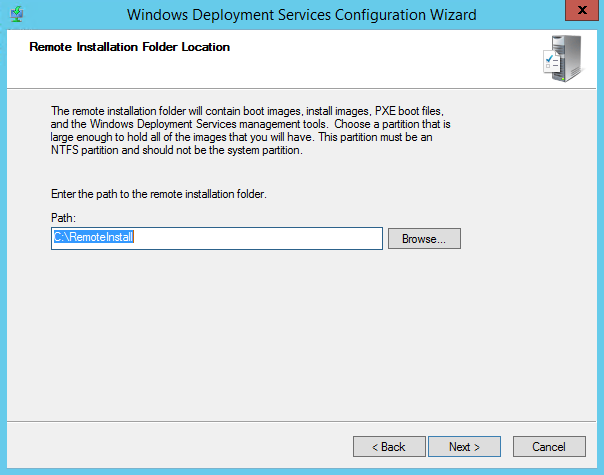 WDS allows you to install Windows over your network to Preboot Execution Environment (PXE) enabled clients. This can save you time when installing Windows on your client computers or virtual machines as you don't have to create and use install media. 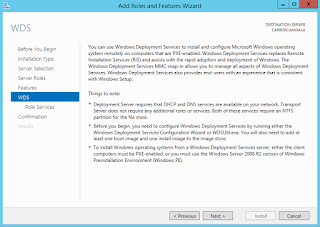 How does Windows Deployment Services (WDS) work? It's quite simple. The WDS server sit on your network and listens for PXE boot requests. When it receives a request, it sends down a boot image to the PXE enabled client. 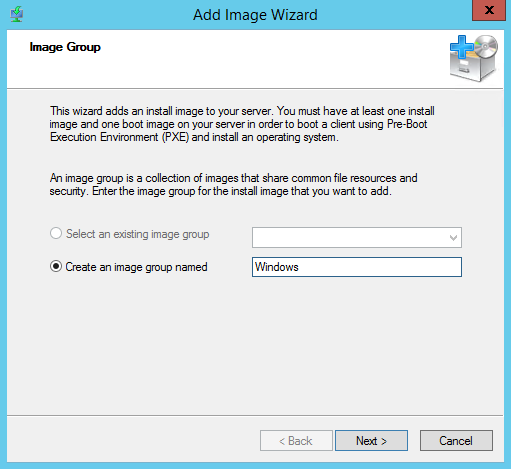 The boot image, running Windows PE is then used to download and install the actual operating system image. 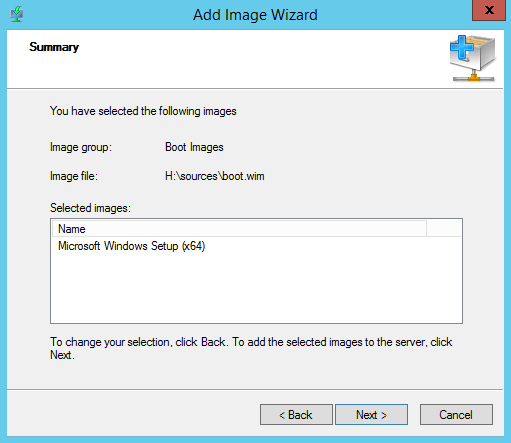 The boot image and operating system image is stored in the Windows Imaging format (.WIM) on the WDS server. This one is pretty straight forward for our Unit34.co domain. Since we only have one subnet, WDS will be deployed on that subnet. What we do need to consider is whether we want to deploy WDS on an existing server such as CARBON.Unit34.co or on a new virtual machine. Our recommendation is on a new virtual machine (called Cobalt.Unit34.co). 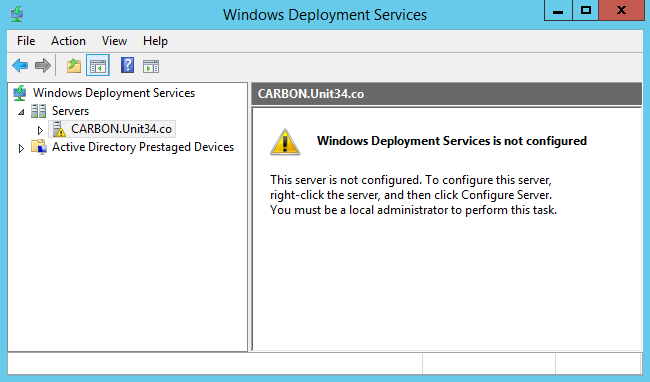 Deploying it to CARBON.Unit34.co is fine as well. Whatever you choose, just make sure there is enough hard disk space provision for the Windows images you wish to deploy. In a domain with multiple subnets, you'll need to work out which is the best subnet to deploy WDS to as well as how to configure the routers with IP Helper trickery. We're not going to cover this here in this article. 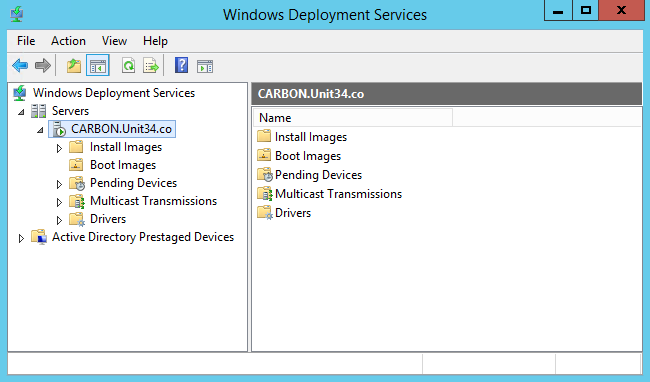 Start by creating a new Windows Server 2012 R2 virtual machine called Cobalt.Unit34.co with enough disk space (40-60 GB) to hold your install images. 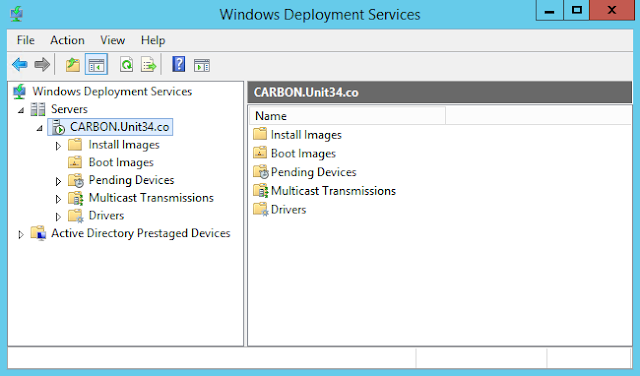 Alternatively you can use install WDS on your Hyper-V host CARBON.Unit34.co. 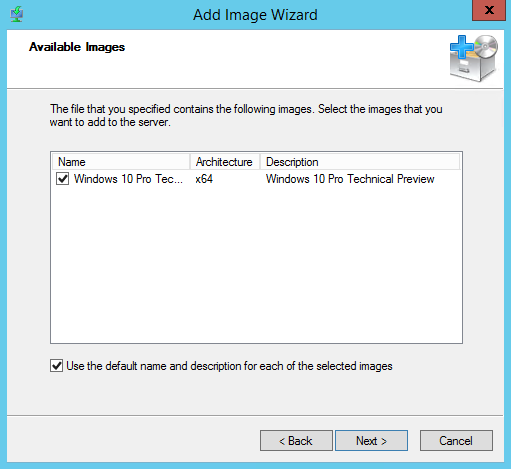 In Server Manager, star the Add Roles and Features Wizard. Continue through the wizard until you get to the Server Roles page. 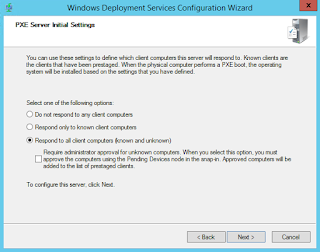 Select the role Windows Deployment Services. Leave the feature selection as is on the Features page and continue through the wizard to install WDS accepting any default values. 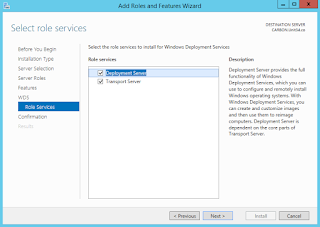 The defaults will install the WDS roles Deployment Sever and Transport Server. 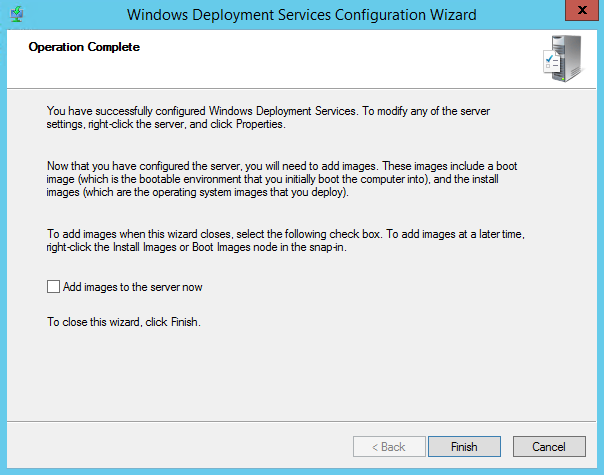 Once WDS is installed, close the wizard. After installing WDS, we need to configure the WDS server. 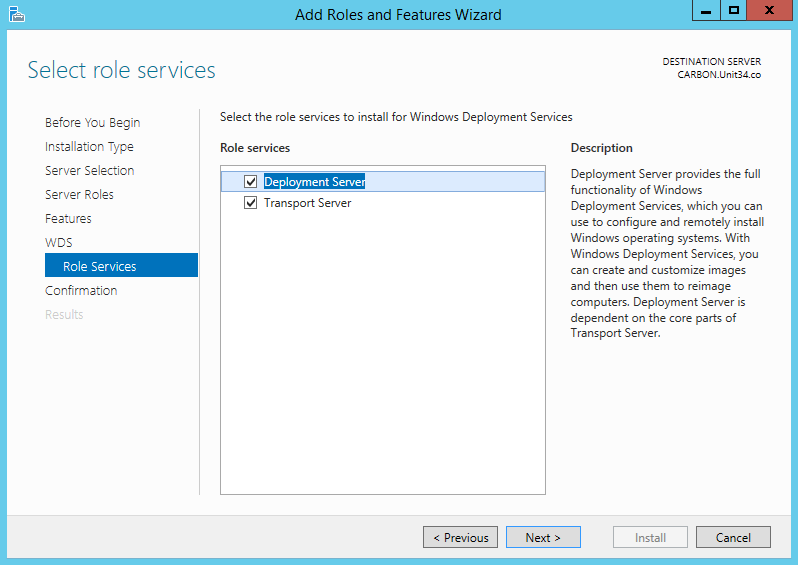 Start the Windows Deployment Services management console under the Tools menu in Server Manager. 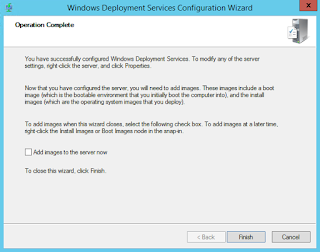 In the Windows Deployment Services management console, right-click on your WDS server and select Configure Server to start the Windows Deployment Services Configuration Wizard. 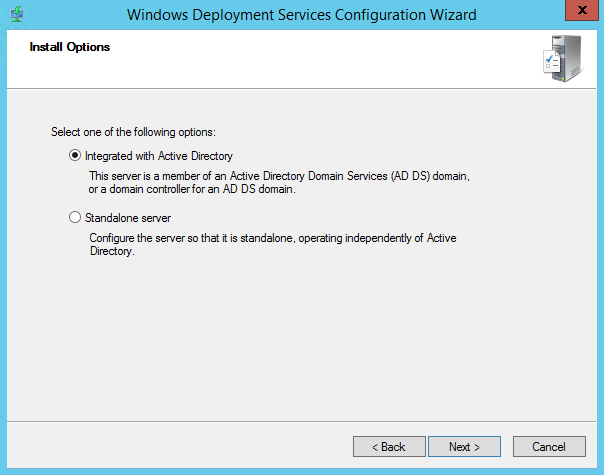 Integrate the WDS server with Active Directory. Enter the path for the remote installation folder. For our lab environment, accepting the default value is fine otherwise please use a NTFS volume prepared earlier that is separate from your system partition. If you've kept the default path for the remote install folder you'll see the following warning. Just click Yes to continue. 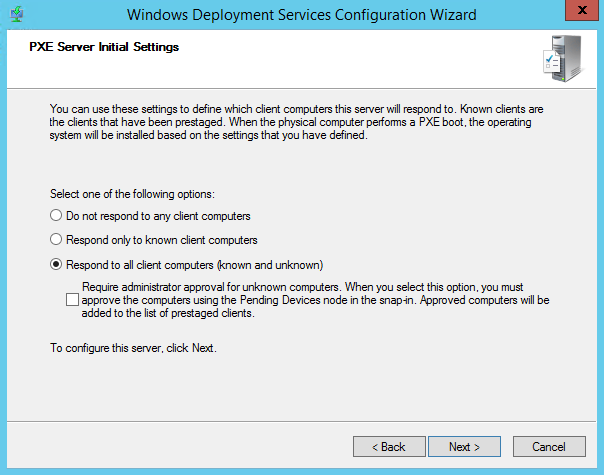 Configure the WDS server to Respond to all client computers (known and unknown) and then complete the wizard. 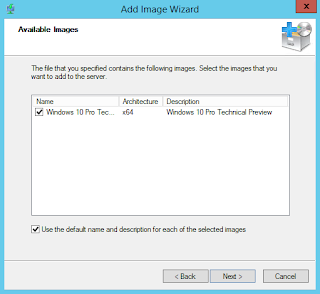 Before we can start deploying Windows over our network, we need an Windows image to deploy. There are actually two parts to this. First we need to prepare and import our boot image. Second we need to prepare and import our actual operating system image. 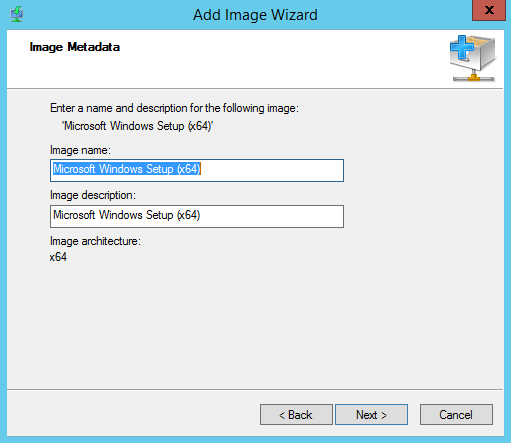 We're not going to cover Windows image management here so in our example, we're just going to use the default images (boot.wim and install.wim) you can normally find on Windows install media. 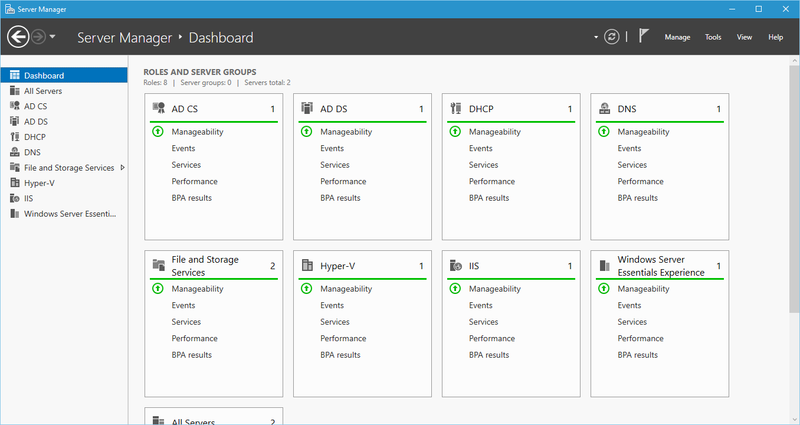 Start the Windows Deployment Services management console under the Tools menu in Server Manager. 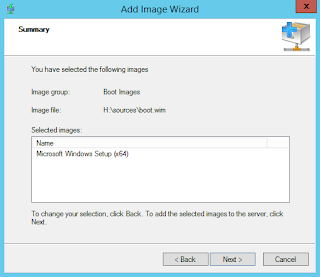 In the Windows Deployment Services management console, select your WDS server and right-click on the Boot Images folder, select Add Boot Image. 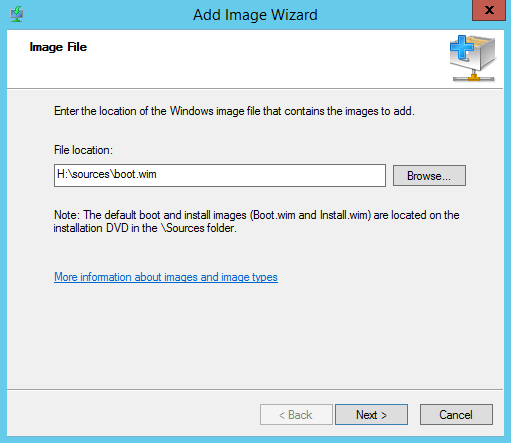 Select your boot.wim file on your Windows install media. It should be located under the sources folder under the root of your Windows install media. Accept all the defaults and complete the wizard. Your boot image should now be imported. 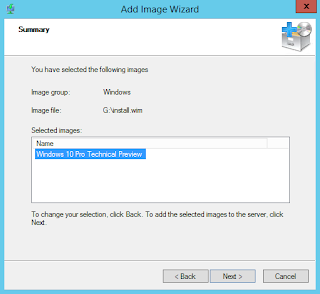 Now back in the Windows Deployment Services management console, select your WDS server and right-click on Install Images and select Add Install Image. The first thing you need to do is create an image group. We've decided to create one called Windows. 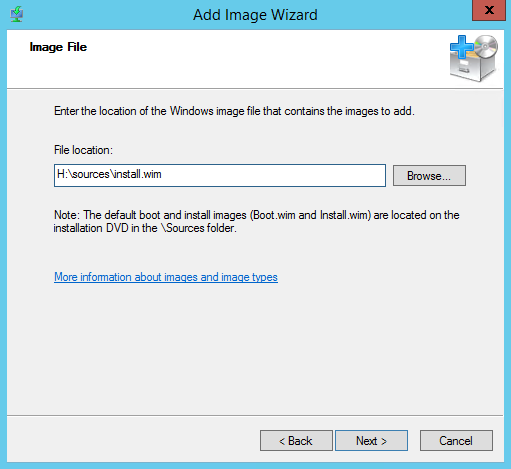 Select your install.wim file on your Windows install media. It should also be located under the same sources folder in the root of your Windows install media. If you don't see an install.wim file but an install.esd file instead, you'll need to export it into a .WIM file. Here's a quick reference on how to do that quickly here. Accept all the defaults and complete the wizard. Your install image should now be imported. How you perform a network boot will depend on the device you are booting. You may need to configure the firmware of the device you are booting. For most computer, hitting the F12 key during boot will cause the computer to perform a network boot. 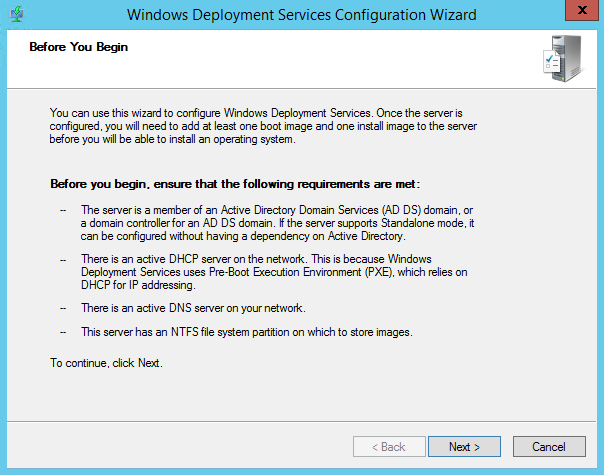 If WDS is configured correctly, performing a network will download the boot image you imported early to the computer and then from there, you can install your Windows operating system. The WD Sentinel DS6100 has 4 drive bays for 3.5" hard drives. If you put one in and the drive bay light lights up red, you may have put in an incompatible drive. The drive is still usable however and most likely there is nothing wrong with it. Western Digital just wants you do know that they won't support it. They would rather you would use one they have specified. Anyway, to use the incompatible drive in your WD Sentinel DS6100, all you have to do is go to the Monitor tab of the Windows Server Essentials Dashboard. Look for the drive bay with the incompatible drive and on the left of it, press the Enable button. You'll get a prompt telling you the drive is incompatible and that data loss may occur. We're not entirely sure how true that statement is. Just simply press Yes to the prompt to start using it. The red light should then go away. Update: It turns out that you need the latest WD components for this option. In an modern environment, the majority of server administration tasks are performed remotely. In this article we are going to introduce to you some of the tools you can use to remotely administer your Windows domain. Before you can perform any remote administration, you'll need a computer to perform the remote administration from. Administrators normally maintain a computer with the latest administrative tools on it which is often also their everyday computer. 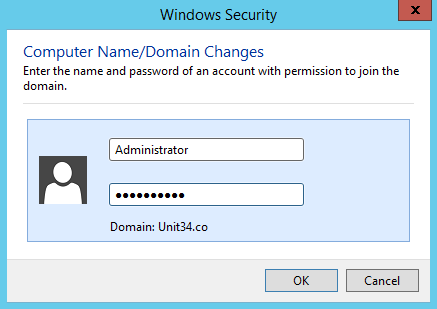 To administer your Windows domain Unit34.co, you will need a Windows computer, ideally domain joined to your Windows domain. We recommend using the latest version of Windows as your admin computer with the latest version of whatever admin tools you are going to use installed. This is a common practice as the latest tools can often also administer systems that are older than the tools are. For the purpose of this blog, we are going to assume you will be doing most of your administration from a Windows 10 or later computer. 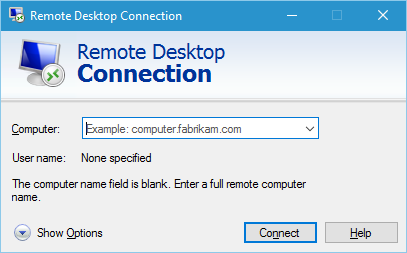 The easiest remote administration tool most administrators learn first is Remote Desktop Connection. This is mainly because this tool is included in Windows. Remote Desktop is also a pretty simple concept. When you connect to the remote computer, you will see the desktop of the remote computer on your screen. You can then basically interact with the remote computer as if you were physically there. There are some disadvantages however. As a graphical tool, Remote Desktop can consume quite a bit of resources, especially bandwidth. You'll notice performance decreases on slow servers and connections. Remote Desktop is also a tool that uses one-to-one connections, making management of a larger number of servers time consuming. 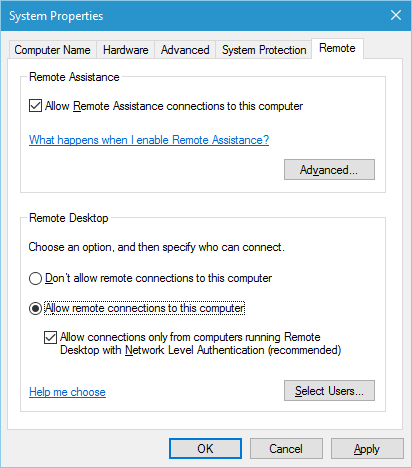 In Windows and Windows Server, receiving Remote Desktop connections is not allowed by default. You must enable this on each computer you want to connect to in the Remote tab of System Properties. Many administrators enable and enforce this setting for computers in a domain using Group Policy. In older versions of Windows, Remote Desktop Connection was also known as the Microsoft Terminal Services Client (mstsc). 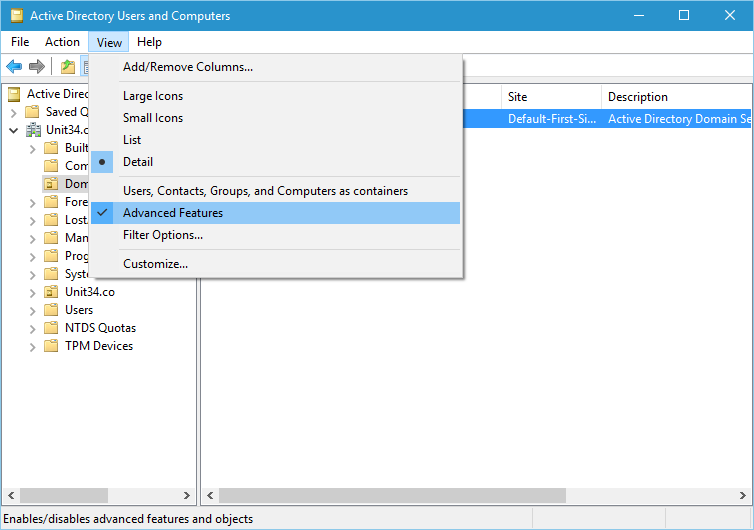 Without going into too much detail, Windows Remote Management (WinRM) is not a tool but a implementation that underpins remote management tools in recent versions of Windows. WinRM is turned on by default in the server editions of Windows (Windows Server 2012 onwards) however is off by default in the client editions. There are two tools that rely on WinRM that we are going to look at. Server Manager is a dashboard-like management console in the server editions of Windows. 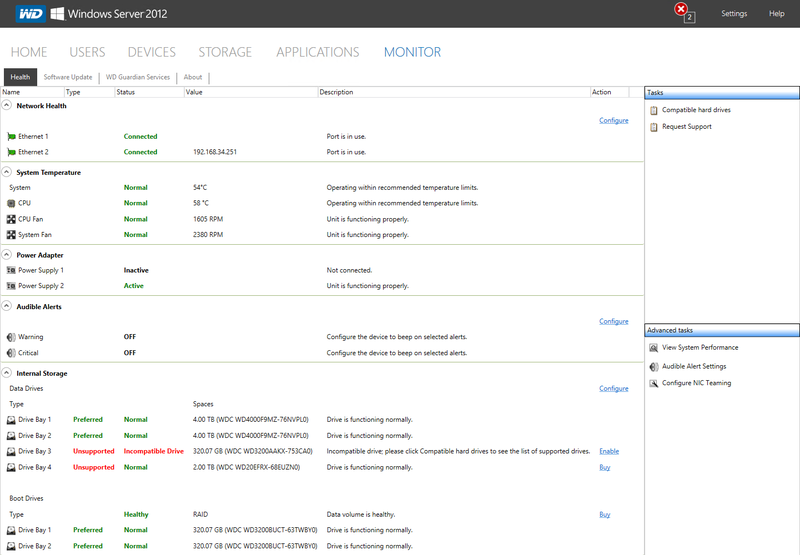 Server Manager allows IT professionals to manage multiple Windows-based servers, both locally and remotely from their desktops. 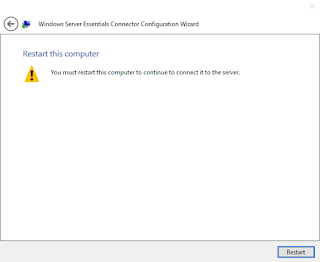 On Windows Server installations with a full GUI, Server Manager comes installed by default and starts automatically when you log in. 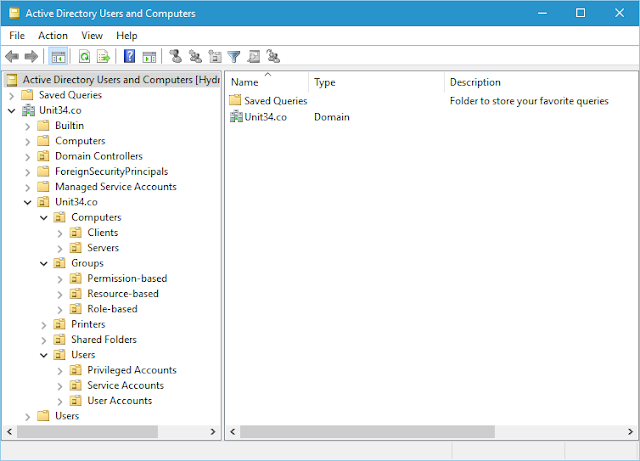 Server Manager can be installed on client editions of Windows and is a part of the Remote Server Administration Tools (RSAT) that you can download from Microsoft. You'll need to find the matching version of RSAT for your version of Windows. 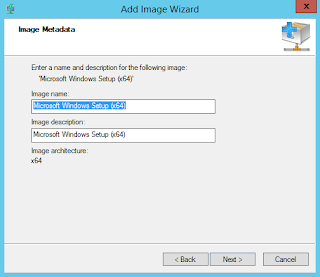 Installing RSAT will also install other Microsoft Management Consoles (MMC) snap-ins which you can use to manager your server. Server Manager is good for managing small to medium sized environments. PowerShell is a powerful command-line interface (CLI) and scripting language for the administration and automation of Windows and Windows Server. It is preinstalled on all modern Windows-based operating systems. Compared to other tools, PowerShell has a steep learning curve however it is the most powerful, especially in large environments. 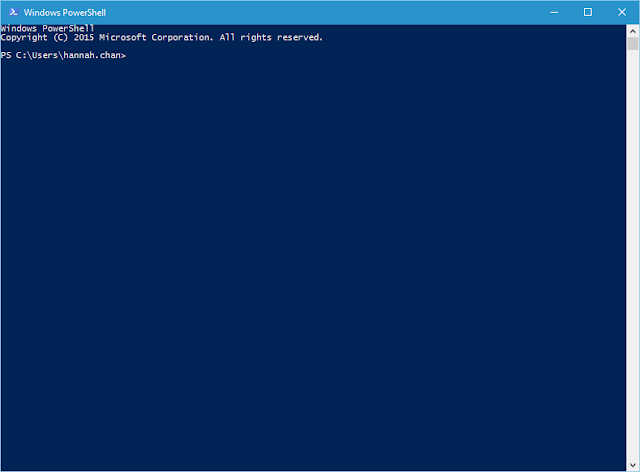 Administrators are strongly advised to acquire skills in using PowerShell. If you are new to PowerShell, we recommend getting started by doing the free Getting Started with PowerShell 3.0 Jump Start course from the Microsoft Virtual Academy. DNS translates easy-to-remember names such as www.google.com into their respective IP addresses which are easier for machines to understand. 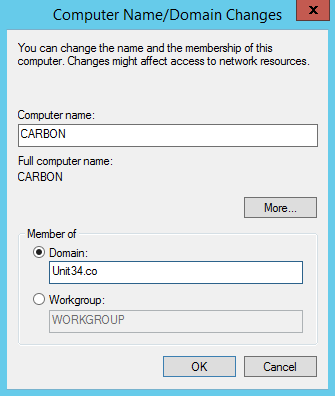 In this article we are going to look at configuring DNS for our Unit34.co domain on our domain controller Hydrogen. 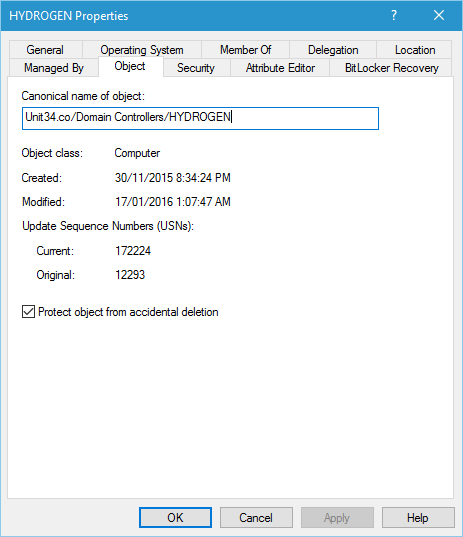 In our earlier guide, we installed and configured the Active Directory Domain Services role on Hydrogen. As part of that process, the DNS Server role was also installed. Make sure you understand the network design for Unit34.co for this exercise. Start by logging onto Hydrogen. Server Manager should start up automatically. Step 1. 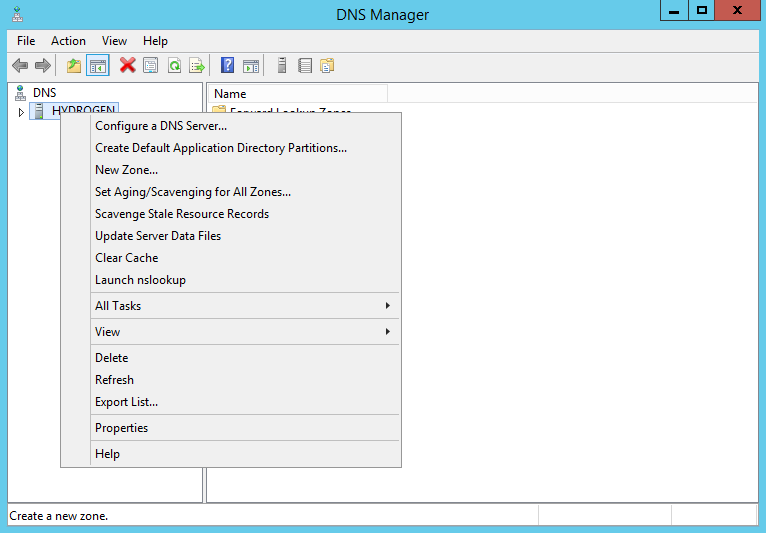 In Server Manager, go to the Tools menu and select DNS to start the DNS management console. 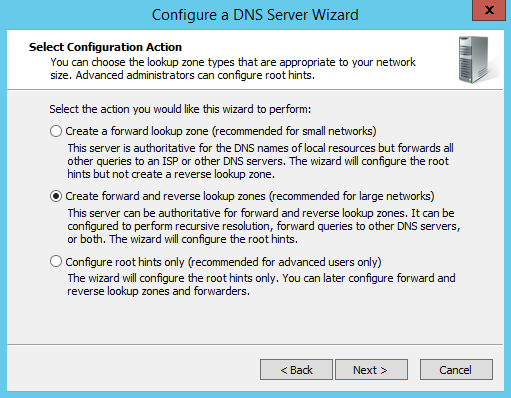 Right-click on the HYDROGEN node in the left pane and select Configure a DNS Server to start the Configure a DNS Server Wizard. Step 2. Select the second option Create forward and reverse lookup zones (recommended for large networks). Step 3. 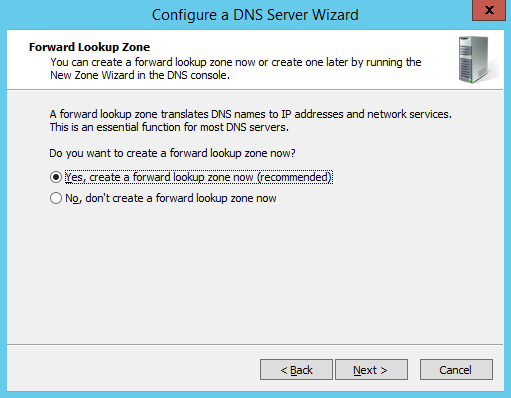 If a forward lookup zone does not exist, select Yes, create a forward lookup zone now (recommended) on the Forward Lookup Zone page. Otherwise select No, don't create a forward lookup zone now and skip to Step 8. Step 4. On the Zone Type page, select Primary Zone. Make sure Store the zone in Active Directory (available only if DNS server is a writeable domain controller) is checked. Step 5. 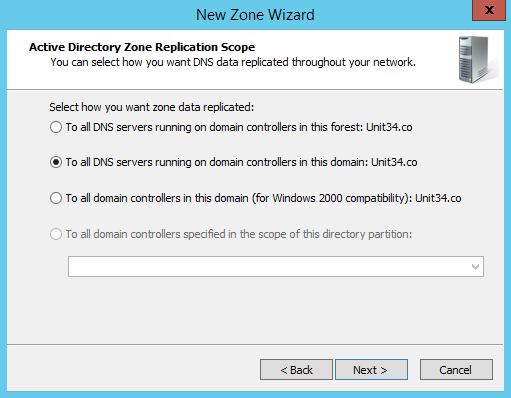 Select the second option, To all DNS servers running on domain controllers in this domain: Unit34.co to replicate zone information to the domain. Step 6. 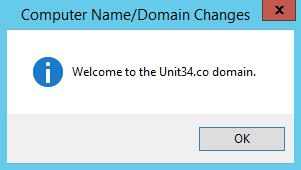 Enter Unit34.co as the name of the DNS zone. Step 7. Only enable secure dynamic updates. Step 8. 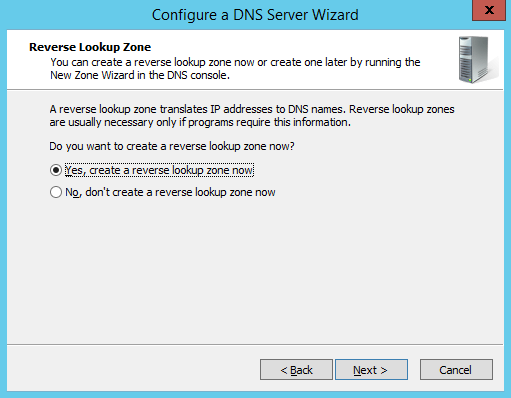 Now create the reverse lookup zone. Step 9. Select Primary Zone again for the zone type. 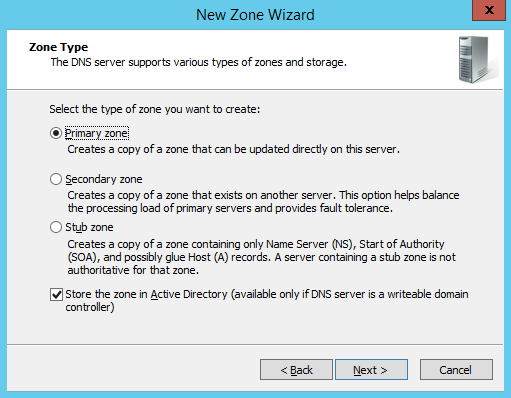 Make sure Store the zone in Active Directory (available only if DNS server is a writeable domain controller) is checked. Step 10. 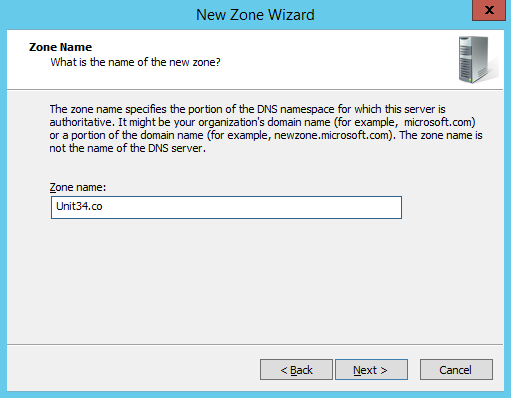 Replicate zone information To all DNS servers running on domain controllers in this domain: Unit34.co. Step 11. 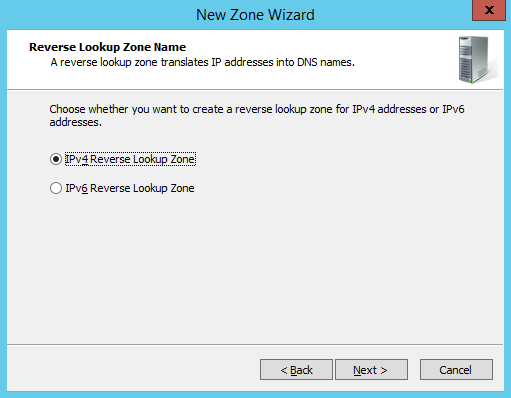 Select IPv4 Reverse Lookup Zone for the zone name. Step 12. 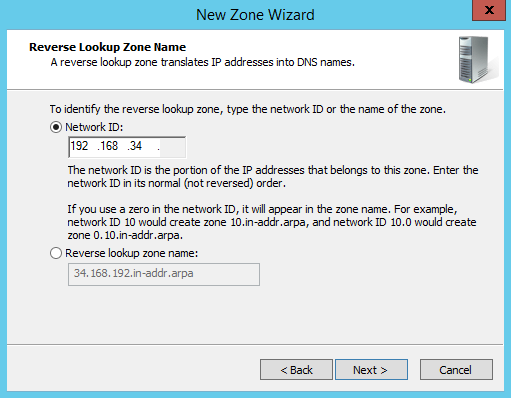 Identify the reverse lookup zone with the following network ID, 192.168.34.0. Step 13. 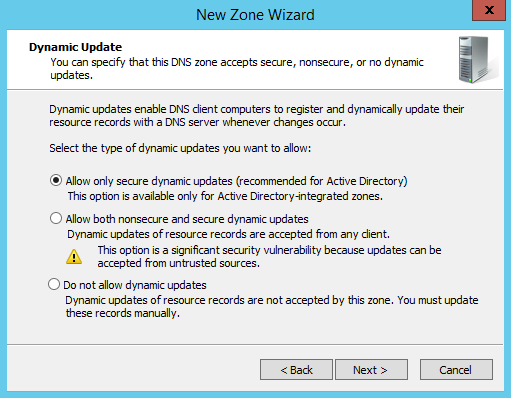 Allow secure dynamic updates. Step 14. 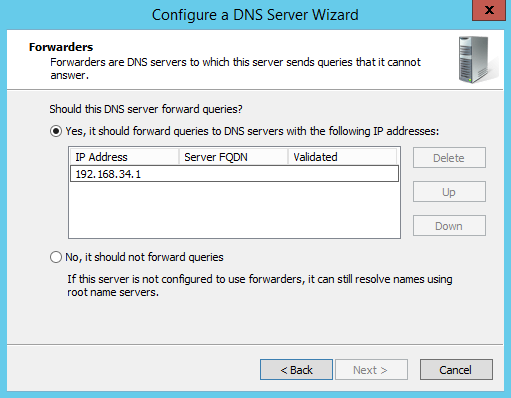 Allow your DNS server to forward queries and complete the wizard. If your router supports it, add your router 192.168.34.1 as your forward DNS server. Alternatively you can add DNS servers provided by your ISP or use the ones from Google, 8.8.8.8 and 8.8.4.4. You can add more than one. Once configuring DNS is completed, we like to add a new host record for our router R0. Add a new record for R0.Unit34.co with the IP address 192.168.34.1 to the Unit34.co forward lookup zone.